With all the buzz about Hurricane Florence, many residents of College Park may not be interested in this week’s mundane rain. However, the exceptional amount of rain we’ve accumulated in the past week may affect flooding if Florence adds precipitation to the already soaked soil. Stay wary and prepared, but there is no need to panic. Check our website tonight for our Hurricane Florence forecast, which will be updated periodically as the storm progresses. 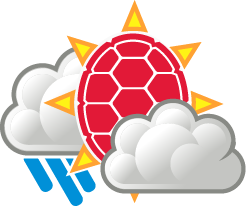 We will also be tweeting important information from @UMD_Weather, so stay tuned. Yet again, expect scattered showers and thunderstorms tonight before 11 pm, then isolated showers for the rest of the night. The chance of precipitation is 40%. The sky will be mostly cloudy with patchy fog after 2 am and wind from the northeast at about 6 mph. The low temperature will dip only to about 72 degrees. There is a coastal flood advisory tonight until 4:00 am. Check the latest river flood warnings for more information about flooding along the Potomac River. There will be patchy fog before 8 am, right after the sun rises. There is also a chance of showers in the morning, and possibly thunderstorms after 2 pm. It will be cloudy all day with a 50% chance of precipitation and winds from the northeast at 10 to 15 mph. The high temperature will be 80 degrees. We are expected to accumulate another tenth of an inch of rain tomorrow. The chance of precipitation is 50% tomorrow night though, possibly with thunderstorms. The low will be 72 again, and the sky will be cloudy with wind from the east at about 9 mph.